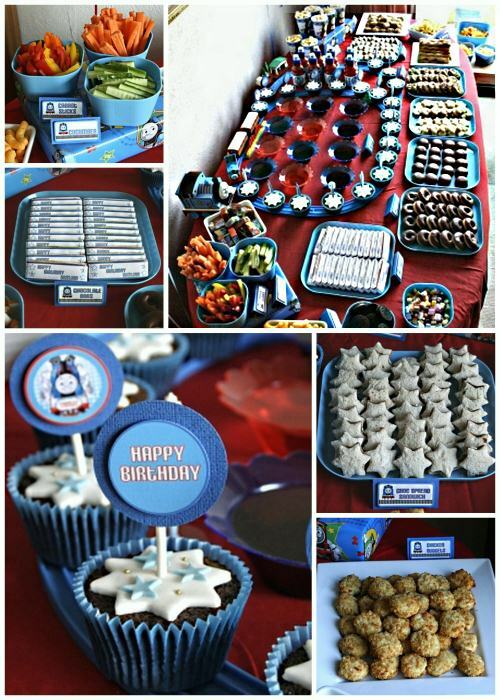 Thomas the Train Party Ideas for kids. This is a favorite theme for kids and we have some great ideas to make this a special event. This is a great theme for young children who enjoy trains. Decorate with train tracks and toys or even have a station set up for children to play with. See our ideas below to help play your party. For some great party supplies be sure to check out Celebrate Express . They have party decorations like personalized banners, invitations, coordinating party supplies, favors and more. Check our Pirate theme to see some of these items. One stop shopping for party supplies can be found at Birthday in a Box! Don't forget to check out the Dollar Tree, WalMart, Target and craft stores for additional party decorations. 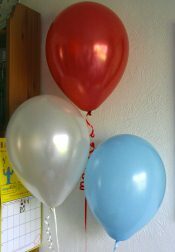 Helium filled red and blue balloons. There are also mylar balloons that you can find with characters from the show pictured on it. Red, blue, or white tablecloth. Print out train pictures and post around the party area. Some sweet treats with personalized labels really are cute! Playdough with your own labels too to customize. Note: You can print your own labels right off the computer by using either sticky labels or gluing them on. Etsy stores offer patterns if you want them premade. Train Picture: With construction paper, cut out pieces ready to glue down for young children. Train, caboose, tracks to make a picture. 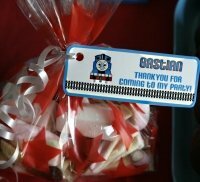 Special thanks to Joey for letting us use his Thomas the Train party pictures. Please note we were given special written permission and we ask that you also request permission before reposting any pictures.